An abandoned farmhouse in County Westmeath. Normally it is the smaller, less-well constructed buildings which are forsaken, but this one was sturdily built and so its neglected condition is somewhat surprising. The interior still contains much of its furnishings, although now in some disarray. Soon the roof will give way and then the walls tumble, allowing Nature to stake her claim to the site. Despite its French name, the concept of the ferme ornée is of English origin and is usually attributed to the garden designer and writer Stephen Switzer. * His 1715 book The Nobleman, Gentleman, and Gardener’s Recreation criticized the overly elaborate formal gardens derived from French and Dutch examples, and proposed laying out grounds that were attractive but also functional: ‘By mixing the useful and profitable parts of Gard’ning with the Pleasurable in the Interior Parts of my Designs and Paddocks, obscure enclosures, etc. in the outward, My Designs are thereby vastly enlarg’d and both Profit and Pleasure may be agreeably mix’d together.’ In other words, working farms could be transformed into visually delightful places. One of the earliest examples of the ferme ornée was laid out by Philip Southgate who owned the 150-acre Woburn Farm, Surrey on which work began in 1727. ‘All my design at first,’ wrote Southgate, ‘was to have a garden on the middle high ground and a walk all round my farm, for convenience as well as pleasure.’ The fashion for such designs gradually spread across Europe as part of the adoption of natural English gardens: perhaps the most famous example is the ferme ornée is the decorative model farmy called the Hameau de la Reine created for Marie Antoinette at Versailles in the mid-1780s. The most complete extant example of this garden type in Europe is believed to be at Larchill, County Kildare. *Incidentally, Stephen Switzer was no relation to the Irish Switzers: whereas his family could long be traced to residency in Hampshire, the Switzers who settled in this country in the early 18th century had come from Germany to escape religious persecution. 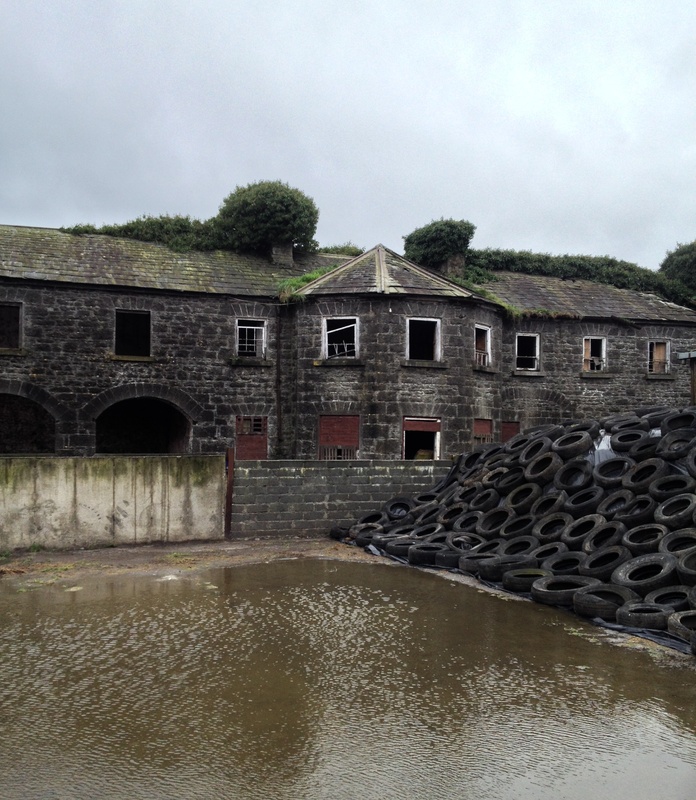 The sadly dilapidated farmyard at Garbally Court, County Galway. The main house and yards were built by Richard Le Poer Trench, second Earl of Clancarty around 1819: thanks to his diplomatic skills at the Congress of Vienna a few years earlier, he had also been created Marquess of Heusden in the peerage of The Netherlands. Lord Clancarty’s architect for Garbally was the London-based Thomas Cundy senior: this was his only significant Irish commission. The Le Poer Trenches remained here until 1922 when the estate was sold to the Roman Catholic diocese of Clonfert for £6,750. Ever since then it has served as a boy’s secondary school. As an area of both study and preservation, the relative neglect of ancillary buildings on Irish country estates has been mentioned here before. While the main house may be – scrutinised, the surrounding structures which did so much to sustain it – is often overlooked. Take the substantial range of buildings shown here today, which lie adjacent to Coolure, County Westmeath. Despite their scale and evident quality of finish, they pass unremarked in Casey and Rowan’s 1993 volume on the Buildings of North Leinster. This is not an unusual circumstance but one that deserves rectification: at the moment if we often know too little about who was responsible for designing and constructing many Irish country houses, we know even less about the origins of their outbuildings. At least some of those at Coolure must date from the same period as when work began on the house proper c.1785 following the marriage of Captain (later Admiral) Thomas Pakenham to Louisa Staples. It was extended in the 1820s, probably to accommodate their substantial family, and the yards may have been proportionately increased in size then also. Finally a number of buildings, not least a vast and now roofless two-storey barn, were erected in the 1850s, thereby completing the ensemble. Changing circumstances along with improved technology, the break-up of large estates, better methods of agriculture, alternative means of transport: all have played their part in making country house outbuildings mostly redundant. Who now needs lines of stables (one set occupied by horses required for riding and carriages, one for animals used about the farm) and coach houses, or piggeries and dovecotes? But the buildings once deemed essential for these purposes, and many others beside, still stand, testament to how rural Ireland operated for centuries. The ranges at Coolure are especially fine, and a credit to the family responsible for their erection. Some have been converted to residential use, and some adapted as storage space or to provide temporary shelter for livestock. But what – to pick a single example from many – can now be done with a hen house, its interior specifically designed to contain rows of niches in which eggs could be laid (and from which they were then conveniently collected)? Buildings such as these demonstrate how an estate with sufficient resources would become an almost self-contained world, producing the foodstuffs required by those living there. Surviving account books from the 18th and 19th centuries reveal just how little needed to be bought, other than wine and spirits (beer could be brewed on site), tobacco and a handful of other luxuries. The fields yielded up their harvest to be stored in barns, livestock provided meat, ponds held fish, walled gardens and orchards were filled with fruit and vegetables. No wonder the outbuildings at Coolure are so substantial: they played a critical role in ensuring the estate functioned smoothly. Deprived of their purpose, buildings such as those at Coolure can slip into decline, although they are perforce so sturdy that frequently they survive longer than the house they were intended to support. Built of rubble and cut limestone, and with slate roofs, these ranges are carefully planned to perform their task with maximum efficiency. Now that job is no longer required, the question needs to be asked: can a fresh purpose be found for them? 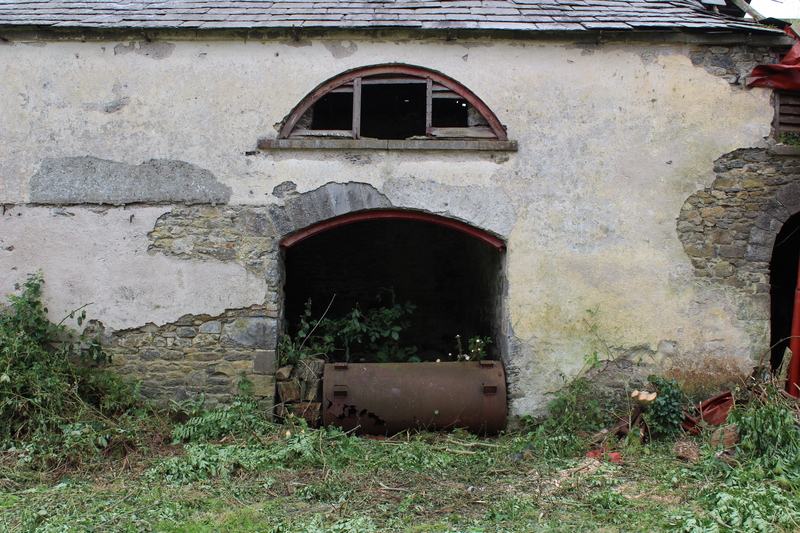 In recent years an annual series of grants to encourage the preservation of traditional farm buildings has been provided by the Department of Agriculture through GLAS (Green Low-Carbon Agri-Environment Scheme) and administered by the Heritage Council. This is intended ‘to ensure that traditional farm buildings and other related structures that contribute to the character of the landscape, and are of significant heritage value, are conserved for active agricultural use.’ Although admirable, the scheme suffers from two drawbacks when it comes to outbuildings such as those at Coolure. Firstly the grants offered, while obviously much appreciated, are not enormous: between €4,000 and €25,000. Secondly, according to the Heritage Council, ‘the key conservation principle of minimum intervention should apply, that is, carrying out a repair to fix what is wrong but not setting out to do too much work. Works which are, in the opinion of the Heritage Council, restoration works, are very unlikely to be supported with grant aid.’ So outbuildings that need to be restored in order that they can find a new function would seem not to qualify. Perhaps another scheme might be established for this purpose? Fine, well-designed and solidly constructed buildings like those at Coolure merit help in finding a new lease of life. The concept of ‘rural Ireland’ and its preservation are much touted, especially by those who live in the countryside and believe their traditional way of life should be given more attention. In practice however little has been done to ensure the traditional appearance of rural Ireland is preserved. Across the country old houses are abandoned, their replacements – often built on sites immediately adjacent to an abandoned property – looking no different from those found in Britain or the United States. This cottage in County Meath, although habitable until recently, has now been left to fall into ruin. Two centuries ago large parts of Ireland enjoyed unprecedented prosperity, and thanks to this affluence there was something of a rural building boom in the post-1800 period with many new houses constructed by both landowners and their more affluent tenants. This Tipperary property would appear to be just such a house. Standing on land that was once part of a large estate, it was probably erected by and for a lessee at the start of the 19th century; the wide overhanging eaves are a feature of that period and in this instance they project almost a foot from the walls, supported on slabs of cantilevered slate. The same slate, which comes from a local quarry extensively mined in earlier centuries but long since abandoned, also covers the roof which is hipped rather than gable-ended. The latter style, easier and less expensive to create, is the norm across much of Ireland and hipped roofs tend to be found in those parts of the countryside where farmers enjoyed the largest incomes. In this instance, the roof was so well constructed that when the present owner bought the house in 1995 he found it required no restoration, other than replacement of old guttering. While the exterior was sound, a lot of work had to be done to the interior because although uninterruptedly occupied from the time of its construction until the late 1980s, the house had no plumbing of any kind and the only evidence of electricity was a single light bulb hanging from the ceilings of the kitchen, parlour and principle bedroom. 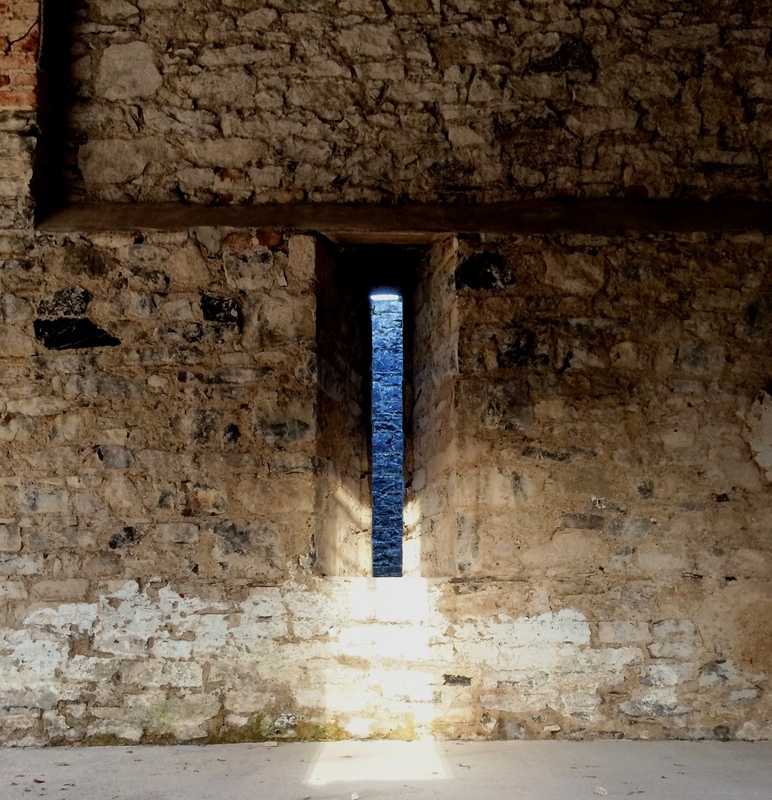 Throughout the premises are indications the original builders had aspirations to raise themselves in the social hierarchy of pre-famine Ireland. The most primitive aspect of the house’s design is found in its treatment of the staircase which, in spite of its elegant joinery, is awkwardly sited to cut across the frame of a door leading into a former pantry (now the kitchen). Likewise its wide treads interrupt the lines of the window immediately beyond – on the other hand this feature can be in many large country houses also. Unsatisfactorily resolved design elements indicates the house’s first owners wanted to build themselves a home that aped aspects of bigger properties but obviously were not sufficiently wealthy or important enough to employ an architect or able to work out certain technical difficulties for themselves. Houses such as this can be found in abundance throughout the Irish countryside, but – unlike this one – they are almost invariably in poor condition or have been abandoned. Our traditional vernacular architecture has been insufficiently appreciated, with the result that much of it has been irretrievably lost. Yet as this building demonstrates, such houses – once occupied by tenant farmers – possess many sterling qualities and can with relative ease be made into comfortable homes (and probably at less expense than undertaking a new-build). Additions, like the conservatory here on the garden front of the house, help to ease the span of centuries and make the place suitable for contemporary living. These properties are as much part of our national heritage as any other historic house. Accordingly they ought to be better cherished than is presently the case.